For the past five years, Standalone Music has been hard at work locating and recording analog synthesizers. The meticulously curated library incorporates a variety of synthesizers ranging old, rare and unusual to new and classic models. The sound of these timeless instruments was recorded at 24bit, using high-quality preamps and AD Converters. 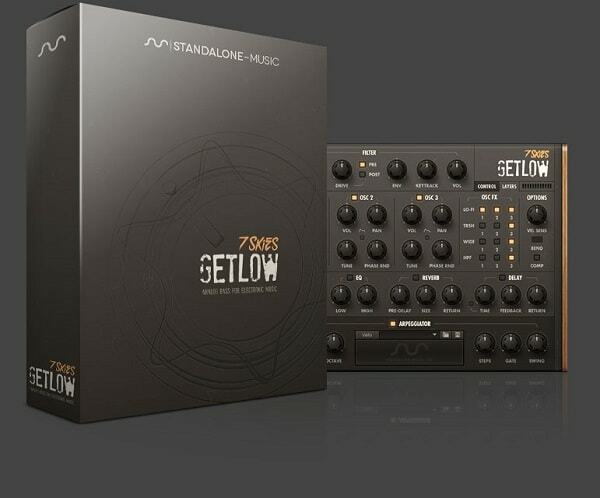 GETLOW also integrates samples from modern digital synthesizers resulting in a product that delivers the ultimate hybrid machine for modern and at the same time analog sounds that are perfect for Electronic Dance Music. Unlike other Kontakt Instruments, GETLOW was designed with modern electronic dance music in mind. Every preset was carefully crafted by music producer and sound designer 7 Skies, culminating in a 4GB content library (unzipped). GETLOW is the ideal instrument that will enhance any Dance, Progressive House, G-House, Deep House, Future House, Trance, Techno, Trap, or HipHop production. In addition to high-quality Bass, we wanted GETLOW to be the best instruments for your productions, that’s why we included over 150 presets that vary from leads, plucks, pads, chords, and arpeggiated sounds making GETLOW the ideal EDM Kontakt library! Kontakt Instruments can be tedious with complex interfaces that may lead to a loss of inspiration. With GETLOW all the necessary controls to shape your sound are easily located, while we control everything you don’t need from the back end. Designed by Lance Thackery, one of the best GUI designers in the business, GETLOW is not just intuitive but also aesthetically pleasing. GETLOW was developed to be 100% compatible with the new Native Instruments Standards NKS. The instrument interacts flawlessly with all the Kontrol and Maschine devices and software. The NKS compatibility allows for quick presets browsing and for auto mapped parameters to control the key knobs of any preset, right from your external device. We wanted to make GETLOW accessible to everyone, and we are pleased to announce that it is compatible with the original Kontakt (Version 5.7.1 is required) and the Free Kontakt Player. Chek that your version is up to date If you own the full version of Kontakt you can update using the Native Instruments Service Center. If you do not own Kontakt you can download the Kontakt Free Player.